RTÉ Director General Dee Forbes has confirmed that 200 or more jobs will be lost as the company undergoes restructuring. She told a staff briefing this morning that the jobs will be lost through voluntary retirement and redundancy. She said the organisation needs to reduce costs. Speaking on RTÉ’s Today with Sean O’Rourke, she said the job cuts would represent around 10% of the current staff levels. The news comes after the announcement that nearly 3.5 hectares (nine acres) of land at RTÉ's headquarters in Dublin 4 is to go on sale with a guide price of €75m. It is thought the land could be used to build up to 500 housing units subject to planning permission. In January, Ms Forbes announced that a portion of RTÉ's land was to be sold and the money used for infrastructure and capital projects. The land has now been put on the market with a guide price of €75m. Property consultants Savills, who are handling the sale, described the land as being in one of the city's most prestigious and high value residential locations. It said what it termed 'Project Montrose' comprises 3.49 hectares of land - part of the existing Montrose complex which consists of approximately 13 hectares. Savills said the purchaser would have the chance to develop a mid-to high-end housing scheme of up to 500 units, a mix of apartments and houses, subject to planning permission being secured. The area for sale also includes Mount Errol House, a protected structure dating from the 19th Century. Speaking on RTÉ's Today with Sean O'Rourke, Ms Forbes said that putting the land on the market will enable RTÉ to inject cash in much needed areas, such as technology. She pointed to recording Fair City in HD as an example of planned investment. Ms Forbes said RTÉ has lost €100m in revenue since 2008, adding that income from licence fees and commercials has dropped, estimating that RTÉ lost €10m in advertising revenue as a result of Brexit and a curtailment of advertising spend last year. Ms Forbes said the industry has gone through unprecedented change over the last number of years and RTÉ has to change with it. She said RTÉ has asked for an increase in the licence fee and that is "ongoing". Ms Forbes said that at 40c a day she believes the licence fee is incredible value for money. Asked what she thought the fee should be, she said: "Quite honestly, I think it should be double that. If you look to places like the Scandinavian markets, where their licence fee is over double what we're paying here, you see what they're getting for that, the content is singing." She said: "The more money we have to play with content, the more we can do." Ms Forbes said RTÉ has worked tirelessly with the Government around the licence fee and it is believed reform of the collection system is the best way forward. She said "we are fighting for survival" and hard choices have to be made. 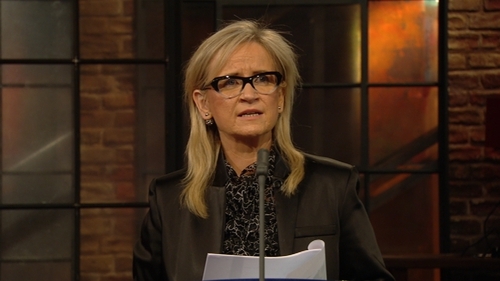 Speaking to RTÉ News, Ms Forbes said it is nonsense to suggest she would encourage the doubling of the licence fee. She said what she was saying was that the licence provides incredible value and if RTÉ had more money it would provide incremental value.